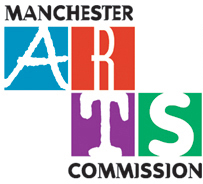 The Friends of Music at Emanuel will present the New England Chamber Choir (NECC) on Sunday, February 21, at 4:00 p.m. at Emanuel Lutheran Church, 60 Church Street, Manchester. NECC is a unique group of gifted amateur musicians that performs only the best choral music from Gregorian chant to classically inspired music written today. 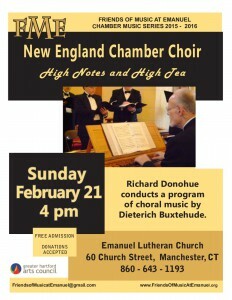 NECC will perform its popular annual concert High Notes and High Tea, followed by a special reception. As always, the concert is free though donations are gratefully accepted.